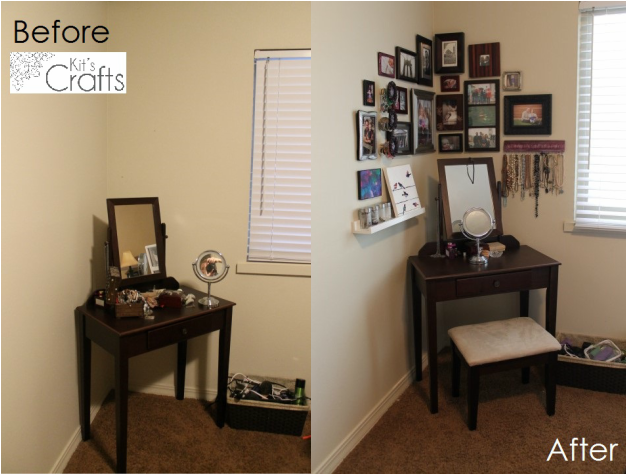 It wasn't long after we moved into our "quaint" condo that I bought this little vanity to make a space for me to get ready. It has been almost two years since and the tiny corner of our bedroom has sat looking pretty bland the entire time. 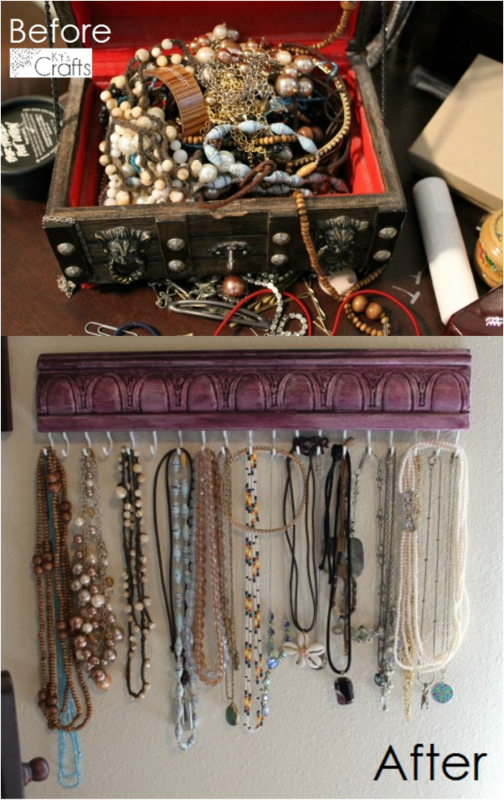 A while back, I decided I was sick of trying to find my jewelry amidst the tangled pile in my jewelry box, which sparked a make over of the entire corner. I have to say, I am pretty happy with the results. So, today, I will post the tutorial from my Jewelry Hooks and on Thursday I will post the tutorial for the Bracelet Pegs. 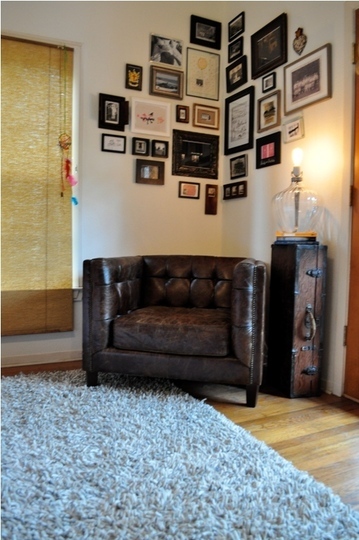 As for the wall itself, I found a tutorial with tips for picture groupings at Tipnut that you can check out. 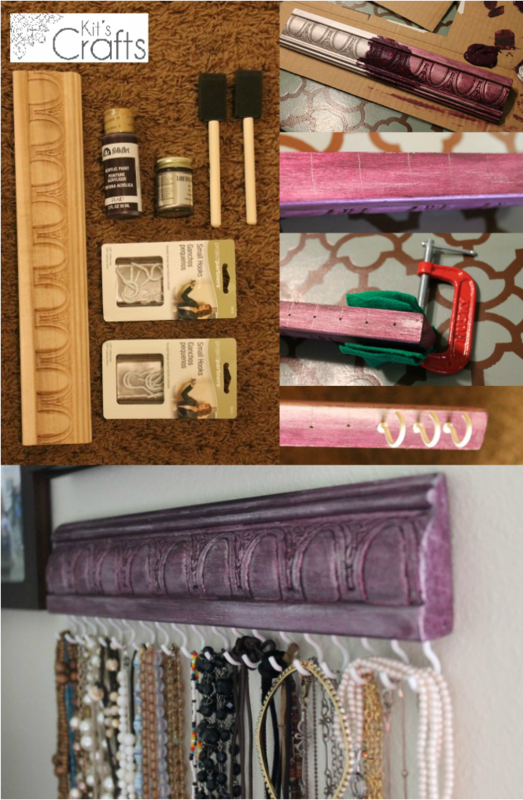 * Start by sanding the edges of your moulding, then paint one coat of acrylic paint as a base, then let it dry and paint a coat of the liquid silver leaf and let that dry. Blotch on another coat of the acrylic paint and rub it off with the rag as you go. * Divide the length of your moulding by the number of hooks you have and mark with a pencil Mark the center of the moulding on each line, then set up the moulding on the table with a clamp on each side to steady it and felt protecting the moulding from the clamps (as in the picture). Nail a hole at each of your marks. 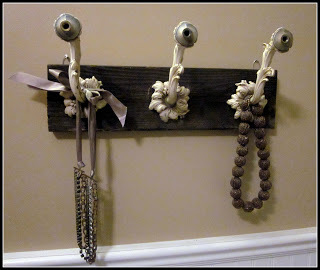 * I found that it was easiest to take the clamps off and hold the moulding between my knees to screw in the hooks. Also, I used one of the pieces of felt to protect my fingers as I turned the hook. * Turn the moulding so the backside is facing up. Divide the length into thirds and mark, then mark about 1/4" from the top. Center 2 saw tooth picture hangers on these marks and attach. 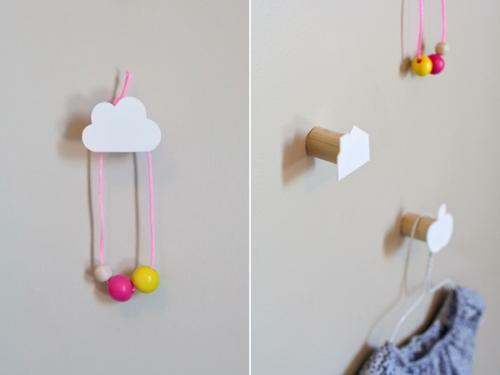 Attach it to the wall and you are ready to untangle your necklaces!